The Skywalker 15-feet Round Trampoline has become one of the finest products in the trampoline market. Trampolines are meant for recreational activities. People jump on it for fun and spend joyful time with their friends. This calls for safety as well. This Skywalker product has features which will ensure a wonderful and cautious time. Many people are anxious about the quality of the product and wonder if it’s worth the price. This Skywalker product has removed anxieties of various customers. Christopher B, a user says, “Great trampoline, easy to put together. Just pay attention”. Yes, this trampoline is meant for kids and adults alike. Trampolines are a great way to hang out with loved ones. It allows the assembly to have fun and chat at the same time. Kids enjoy jumping on a trampoline. In this age of video games, no kid opts for outdoor games. But with this innovation, they will. The jaunty adventure will also perk them up. So, keep your kids in safe hands with this Skywalker product. Trampolines can be very dangerous if safety is messed with. Hence, before buying trampolines, the safety factor should be checked. The Skywalker 15-feet Round Trampoline has a tick on this factor. Another necessary element is the size and shape of the device. Size of the trampoline should be chosen keeping various factors in mind like-size of backyard, number of family members and their age and the mobility of the trampoline. Hence, before buying a product you should collect all the positive and negative sides of the product. Many reviews are not trust-worthy and do not furnish a detailed description of the product. But if you read on, you will get to know the pros and cons of this Skywalker innovation. Weigh them and then decide if this product suits your needs or not. So, let us see if Skywalker delivers its promises or not. The Skywalker 15-feet Round Trampoline comes with steel t-sockets which attach the safety net to the trampoline base. These sockets prevent the structure from twisting. Hence, they are helpful in the safety aspect of the product. The trampoline structure stands on 6 W-shaped legs for stability. They are made up of heavy 16 gauge galvanized rust resistant steel. Thus, no matter how harsh the weather is, these legs will stay intact. The structure will not collapse with these strong feet. This enhances the durability of the product. The Skywalker 15-feet Round Trampoline has a 15 feet diameter. This size requires some space in the backyard. It is suitable for large families. Kids would love to jump on a 15-feet diameter trampoline. Hence, the size of this Skywalker product is exhilarating. It will certainly deliver a fun time. What’s in the Shape? Everything! Yes, one might wonder what shape has to do with a trampoline. But shapes are crucial. The shape of a trampoline affects the bounce, jumping area and the yard space used. The Skywalker 15-feet Round Trampoline has a round shape. Round shape works best for any user. All the springs are spaced equally so they ensure a consistent bounce. It also lands the jumper back to the centre no matter where the take-off was made. The entire frame absorbs the pressure exerted with each jump. So, the trampolines quality does not get affected. Round trampolines are easily to move anywhere in the backyard as well. Do not Miss the Weight and Age Limit! Yes, the weight limit of a trampoline is very crucial to know. This knowledge is useful for maintaining the safety of the user. If an adult is told to jump on a trampoline for kids, then disasters can happen. This Skywalker product has a weight limit of 200lb. Therefore, do the maths before letting people get on this piece. The product also has an age limit of 6 years. Therefore, keep them in mind. 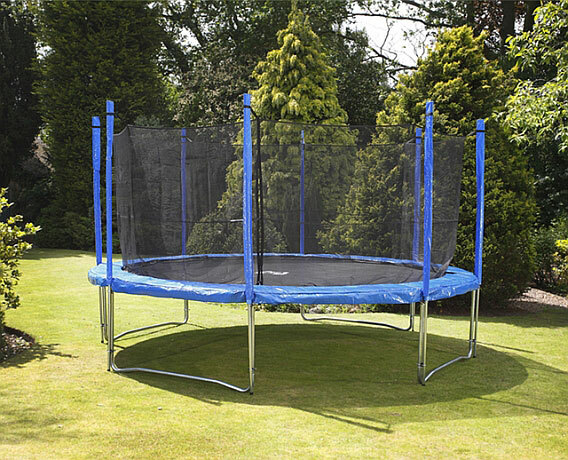 The Skywalker 15-feet Round Trampoline has a spring count of 96. Thus the product gives an enormous bouncy effect with each jump. Hence, enjoy this product to the brim. The frame of this Skywalker product is enclosed with a safety net. This net is made up of UV resistant material. So, do not worry about the harmful rays of the Sun while you enjoy a bouncy journey. This safety net is attached to the jumping mat with the help of a patented button-hole feature. There are V-ring eliminating gaps at which the net is attached. Yes, all of us want a guarantee. No matter how much one brags about a product, warranty is the final perk. The Skywalker 15-feet Round Trampoline comes with a one-year warranty. This Skywalker product is equipped with foam pads on the surface. This helps us to provide comfort during the jumping. This also enhances the durability of the product. This Skywalker product costs $361.65. Customers have reviewed it at us the best priced product in its market. This trampoline offers tremendously at a cheap price. It will not let you regret loosening you wallet. The user manual has written instructions all over. For a product like trampoline, a graphical instruction manual should be provided. So, you might face a bit difficulty in assembling the product. The Skywalker 15-feet Round Trampoline is full with pros and cons. The product ensures safety, is meant for kids and adults alike, is weather-proof and provides recreation to the fullest. Though, the installation process might give you a hard time, it is worth it. Hence, the product is worth the price it is set at. Purchase the product and become one of the satisfied customers of the Skywalker Company!